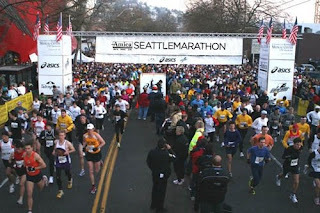 Jared and I are training to run the seattle Half Marathon! Its not until Nov, so we have plenty of time to get ready. We are running a region 10K next month. I am very excited about it. I am gaining such a passion for running. I hope to some day run the Boston Marathon! I don't know if Jared is as passionate about running as I am, it took some coaxing to get him to agree to run with me, let alone run the half , but at least he's doing it! That's fantastic! Chelsea (Evan's wife) ran the Boston a couple of years ago and is running the Chicago Marathon in October. Crazy, since she just gave birth 7 weeks ago, and has to qualify by August. Katie is here in town and we are running the Bolder Boulder (a huge 10K) on Monday. Check out my blog for some post-race pictures!